Think about the three people you are most grateful for in this world. Is it too hard to narrow down just three? How about five? It’s amazing how deeply our lives can be impacted by the people God places in our lives, and let’s all agree, some people are absolute treasures to us! Now, let me ask you another question. Do you believe in your heart or hearts that someone out there would consider you to be one of their three people? If so, I know that brings a lot of warmth and value to your heart. But if you don’t believe that, I’m sure you have questions about your value to the people you love, and that can be a very lonely place to live. What would it mean if a person sacrificed the thing they love most in this world in order to restore a relationship with you? It would mean everything, would it not? 1 Corinthians 7 says that God paid a high price for you--one that none of us deserve or asked for, but a relationship with you was so valuable to Him that he sacrificed the life of his only son, Jesus, in order that you could be with him forever! So whether you feel valuable or not, value is based on what someone is willing to pay for something, and the price God paid is higher than you could ever imagine! Have you ever heard of the five love languages? It is a great study conducted many years back which compares how different people feel and express their love. One thing they realized was that people express love in extremely different ways, which leaves room for a lot of miscommunication. 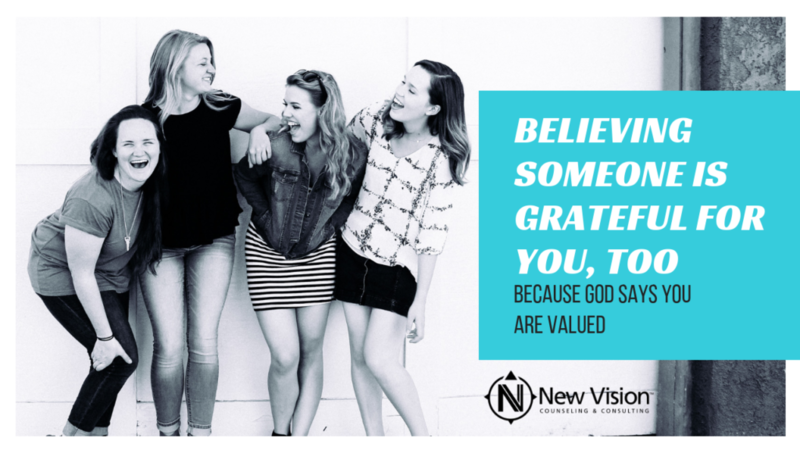 Be encouraged that just because someone doesn’t express their love and gratitude for you the way you expect doesn’t mean that they aren’t immensely grateful for you! It just means that their love language is different than yours. More than likely the way you express your love for others may not be the way others expect as well. So give your loved ones the benefit of a doubt and try to translate their actions in whatever love language your love ones speak best. If you feel undervalued or neglected by those you love, speak up! There is no point in walking around with open wounds. Be transparent about how you feel. Share the ways that you feel you need to be loved in order to feel valued and appreciated. This will allow any bitterness in your heart to be removed and you can move forward in your relationship with healing and understanding. When was the last time you explicitly told someone how grateful you are for them? What is your love language? If you’re unsure, you can take the test here. Who do you need to have a conversation with to resolve this pain?